Vail Resorts, announced on Wednesday that it has submitted a proposal to expand Vail Mountain’s race and training terrain at Golden Peak. The proposal, which is subject to U.S. Forest Service approval, includes increasing the size of Vail Mountain’s operational boundary by 68 acres to allow for approximately 41 acres of additional trails, three surface lifts and new snowmaking infrastructure. With these improvements, 760 vertical feet would be added to the venue, providing 1,570 vertical feet of racing and training terrain across approximately 68 acres. 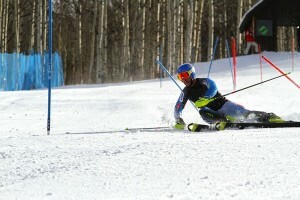 Vail’s Golden Peak could be expanding for race training (Vail Resorts photo). “Since Vail’s inception in 1962, ski racing has been a part of its heritage, and our partnership with Ski and Snowboard Club Vail in the development of future generations of athletes dates to the beginning of the resort as well,” said Chris Jarnot, senior vice president and chief operating officer of Vail Mountain. For more information about Vail Mountain visit www.vail.com stop by the Mountain Information Center, or call (970) SKI-VAIL (754-8245). I believe this is not only great news for SSCV but for snow sports as a whole. It is giant leap forward for a resort like Vail to promote and accommodate snow sports in general and the SSCV specifically Without support from resorts snow sports for the thousands of youth athletes would be improbable and fielding a competitive World Class team would be impossible. A Big Thanks to Vail and all the resorts that allow snow sports to flourish.